Location: 125 miles N. of S.F. Last edited by inthewoods; 08-13-2014 at 04:51 AM..
Way cool!!! Did you know/race with Jimmy Jepson? He was one of the KFG's back in the mid '80s, though I don't know what series, probably AFM maybe a little AMA. He was a buddy of mine back in the day, yet since lost touch. I bought his GSXR750 listed as one of his bikes owned. It was a bone stock bike with a WP rear shock. I actually beat Jim Jepson on it and a few other fast AFMer's during the late 86' season and some of 87' before I got frisky in the carousel and retired it...no problem...I had the hurricane waiting in the pits. I wish I still had some of these old bikes. Here I'm sweeping up on Chris Crew (#89) and Jimmy Jepson (AFM#1)...fast company for sure. The good old days. God Speed Nicky #69...we'll miss you. Last edited by FZ1MinesRdRipper; 12-05-2016 at 02:51 PM..
AFM - '76 - '88. First #223, then #222 for quite awhile in both AFM & AMA. Others over the years were #83, #56 primarily. Also whatever the club name Willow Springs was in the 70's. Sprints, Nationals, 4hr, 6hr, 24hr. So many races and practices all across the country not sure I'd remember all of them. 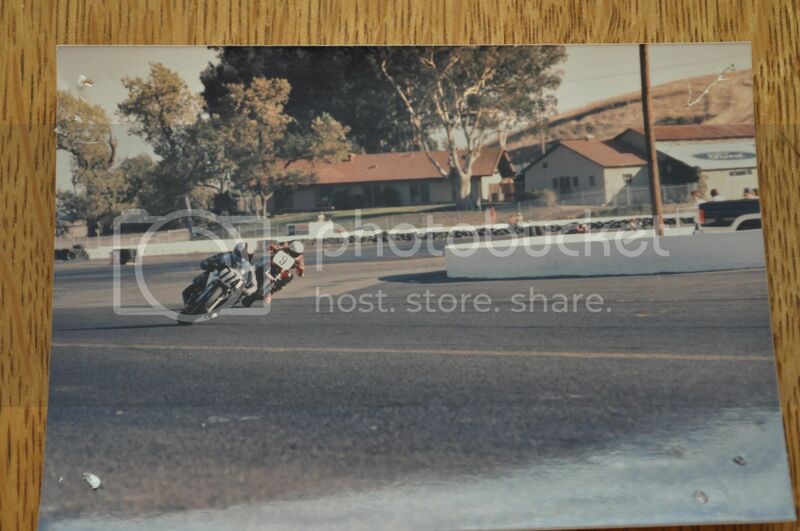 Finished racing Pro in Japan 1988 at the Suzuka 8 hour for Over Racing on OWO1 Yamaha with partner Rich Oliver. ABC Wide World of Sports Superbikers in I believe '84 & '85. Lots of Motocross to stay sharp, some dirt track as well. Still rode/ride lots on the street. But at a greatly reduced rate since losing Dave Emde. GS1100 (still owe John Ulrich an Endurance Race for this), Mr Jags Norton, KZ750, Pete Essaf KZ1000 Sidecar, KB Z1 Sidecar, GSXR750, KX450 Supermoto with Slicks, FZ750, OWO1. Teams Ridden for - Goodyear, Yoshimura R&D, Mr. Jags, Warland Engineering, Bob Balentine/Performance Works, Lockhart, Racers Supply, SuperTrapp, Over Racing, and probably forgetting too many (sorry). RR Tracks Ridden - Sears Point (home ), Ontario, Riverside, Willow Springs, Firebird, Portland, Cesar's Palace, Seattle, Elkhart Lake, Loudon, Pocono, Daytona, Taladega, Button Willow, Suzuka. Mick Parkinson, Dave Emde. And a host of others. Gone but not forgotten. Industry Hero's when I started out - Pops & Fujio Yoshimura, Sandy Kosman, Darryl Bassani. Still call them friends today (Pops rest in peace). The AFM & Bay Area was a very important part of who I am today. Along with the many friends made and kept throughout the years. Hard to believe how fast the time has gone. I bought your old 86' GSXR750...well it was new at the time. I one some cup money with that bike. Still one of the sweetest handling bikes. I can still remember exactly what it felt like to twist the throttle on her. I still had your old number on it in this picture. That's me leaning against the old Cadillac tanker...ha ha. I had some great battles on this bike...thanks again for selling her to me...we both wish we still had it I'm sure. AFM 85'-87' 600SS, 600 Production, Formula1, OpenGp, 750 Production, 750 Mod Prod. 85' RZ500, 86' FZ600 92' FZR600 (short lived come back) 87' Hurricane, 86' Ex Kerry Bryant GSXR750. Budman...we need to find some old archives showing the race results from 80's. It seem the AFM has lost them or doesn't want to dig into the boxes at the warehouse? I think this is very important history from one of the best amateur road racing clubs of all time. They should be put on digital media to preserve them. Might make a come back in the next few years to show a few young bucks how it's done...well top 10 would be pretty good with a good bike. I'll probably get smoked. Last edited by FZ1MinesRdRipper; 09-29-2017 at 06:17 PM..
hey guys, I'm new to the area and plan on racing with AFM next season. I have a '13 Ninja 300 and am hoping to get connected with any other lightweight guys who may be in the west los angeles area. I just moved down from Alaska where the only road racing involves an abandoned airstrip, cones, and spraypaint, so I'm stoked about getting back on some real tracks! We'll see you at some of the AFM races James! Going to make it a goal of 2017 to update the first post with everyone that has chimed in on this thread. Looking through the initial post and this thread has left me with a warm heart and some wonderment on where peoples lives have taken them. Thank you AFM for the opportunity to have so much fun. Well, I am back in the AFM after a several year hiatus. I first raced with the AFM in 89-90 and off and on for many years since then. It's been close to five years. This time it's going to be F50 ( as there is no F60 or F70) and probably Legacy. Too many fast kids out there. Good to see a post spark this thread back up. DTRIDES and HYPAH in da AFM house!! DTRIDES and I passed the New Racer School in March with Carters@thetrack, immediately signed up with AFM, and got our numbers! Our first race day will be June 29 at Thunderhill. Waiting for the AFM email to arrive that registration is open!